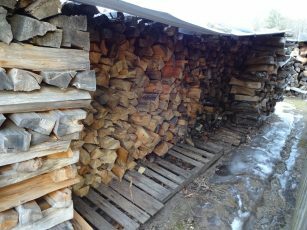 My sapwood pile has noticeably shrunk with all this maple sap boiling, which makes me wonder how much wood my little evaporator eats to spit out some maple syrup. Well, so far it’s roughly 1/2 cord to 5 gallons of syrup. “Sapwood” consists of hemlock, aspen, sassafras, & catalpa; species that burn hot & fast. Tags: Catskill Forest Association, Catskill Mountains, maple sugaring, maple syrup, sapwood Categories: What's New?